There is a reason our Missouri River fly fishing guides’ June calendars are often booked a year in advanced: the fly fishing on the Missouri River is just that good. There isn’t much that needs to be said about Missouri River summer fly fishing trips. Daily hatches of PMDs, Caddis, Little Yellow Sallies, ants, hoppers, beetles, and a mish-mash of other bugs makes for some of the best fly fishing you will find anywhere. The big brown trout and rainbow trout of the Missouri River can be found sipping flies from the Dam down to Cascade and our anglers are on the hunt searching for them. The nymph bite is rock solid and the streamer fishing early and late in the day can be a great way to find the bigger fish. Our Missouri River fly fishing guides will often times be on the water at first light and stay out into the evening with clients this time of year to take advantage of warmer weather and longer days. This is can’t miss fly fishing for any angler. July and August bring more of the same. Great hatches continue with Tricos showing up by the end of July. This hatch is like smoke on the water, with selective trout gobbling up dead tricos by the hundreds. 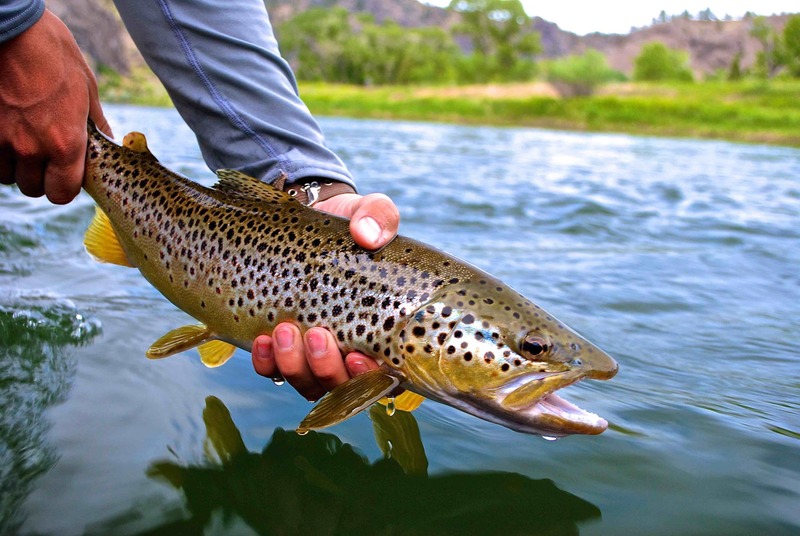 Hopper and terrestrial fishing keeps things interesting and can often produce larger brown trout and rainbow trout. The nymph bite and streamer fishing stays good, but annual aquatic vegetation growth puts a damper on the bobber party. That’s right: bobber party. But with a good cast and mastery of the “goodbye-grass-snap-cast” technique you can keep the good times rolling. River flows stabilize by July, water temps are warm enough to wet-wade, and the fish and our anglers are happy.